Microsoft confirmed that Office 2016 will officially start rolling out on September 22nd for Windows. Here’s a look at new features and reasons to upgrade. 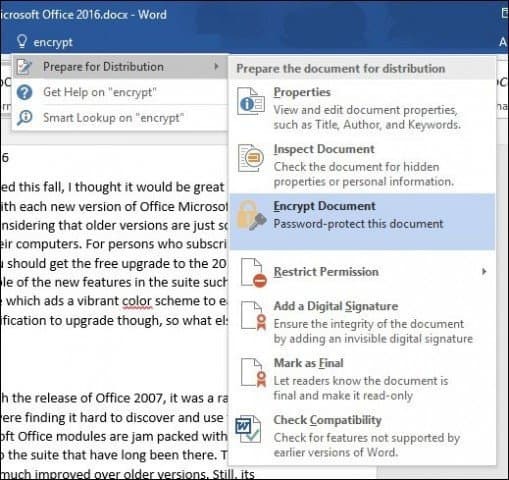 The Microsoft Office 2016 release is just around the corner, and we thought it would be a great time to check out what’s new and improved in this release. 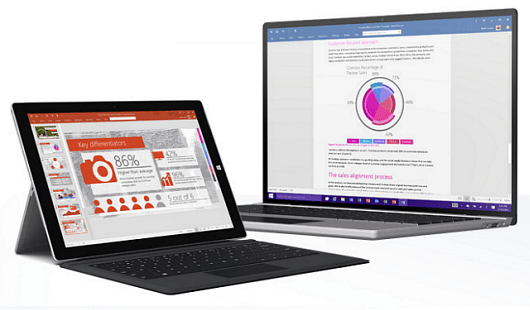 Microsoft confirmed that Office 2016 will start rolling out on September 22nd. With each new version of Microsoft Office, it becomes harder to justify the upgrade considering that older versions are sufficient already. It’s not surprising to still see some PCs running Office 2007 which was released almost 10 years ago. For people who subscribe to Office 365, if you maintain an active subscription you’ll get the free upgrade to the 2016 release at no charge. 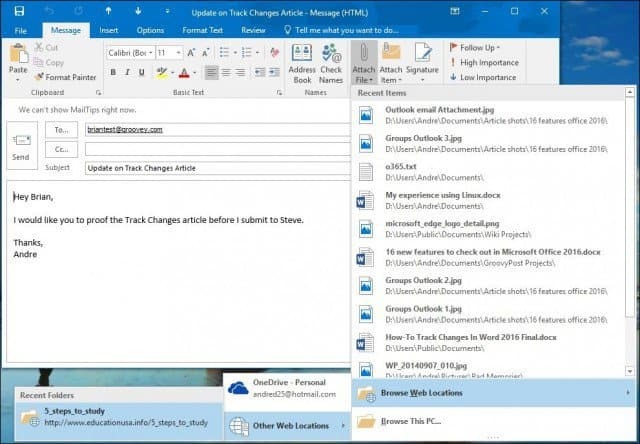 We previously looked at a couple of the new changes in the suite such as Outlook Cloud Attachments and the Colorful theme which adds a vibrant color scheme to each programs brand identity. A theme can hardly be justification to upgrade though, so what else is in there that could push you off that older version? When Microsoft introduced the Ribbon interface with the release of Office 2007, it was a radical departure to make the suite easier to use. Users were finding it hard to discover and use features that were hidden in the suite. The Ribbon made discovery and accessibility of features much improved over older versions. Still, it’s hard to find certain functionality or to find the right tool in the suite for the job at hand. For this Microsoft introduces Tell Me which first appeared in its Office Online suite. The Tell Me feature utilizes natural language so you can find what you are looking for, and is supported in all apps in the suite sans Publisher, OneNote, and Skype. The Tell Me box appears at the top of the Ribbon. Say you want to protect a file, just type it in and it will present appropriate suggestions. You can even immediately access functionality within Tell Me, its not just a search results function, it really helps you get things done. 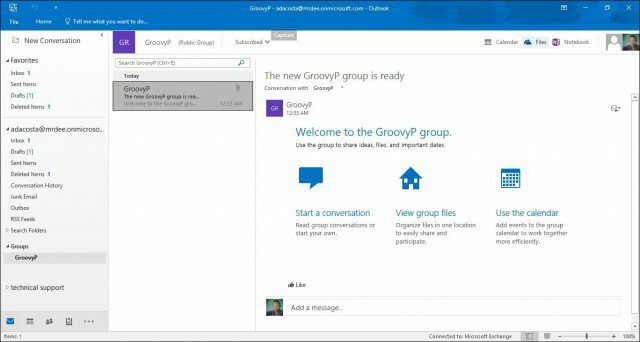 Office 2016 improves the real collaboration features in the suite’s core apps. 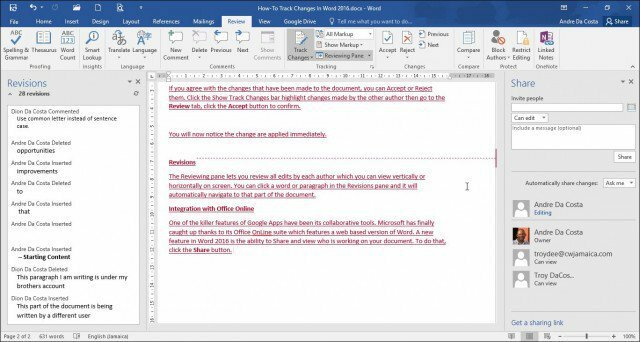 Word, Excel, and PowerPoint make it easy to work on files with multiple authors, whether they are using Office Web Apps or the desktop client. You can easily invite, share and restrict editing through a new Share Task pane. We previously looked at using this feature in our article on how to Track Changes using Word 2016. Backstage view was introduced in Office 2010 and has not seen much of an update since. But Office 2016 Backstage adds improvements such as better access to storage locations, you can easily save, open, access documents too. Now you can save time by attaching Office documents from the Ribbon or Action Bar that you most recently used to your emails by picking your document from the dropdown options. For files already in OneDrive, OneDrive for Business, or SharePoint, you have the option to share them as an “Edit” or “View only” link instead of as a traditional attachment. This enables collaboration on one copy of a document instead of several. If you use Office on a touch device with a smaller screen, you’ll see improvements to how it handles the layouts better. Just select a message like you would on a Windows Phone device, and when you are finish reading it, just tap the Back button. If you work with large data sets, then Excel is the perfect business intelligence tool (BI) to use. You will be pleased to find that Excel 2016 integrates Power Query into the app which was only as an add-on before. 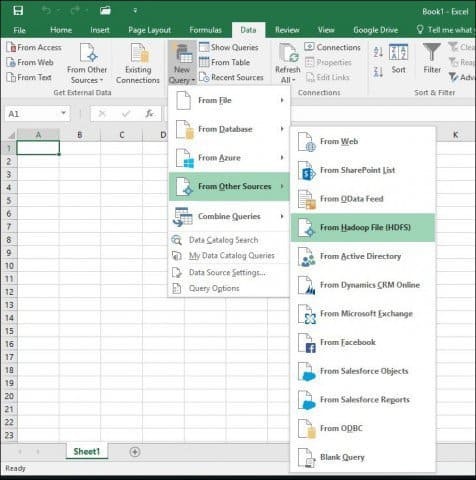 Power Query provides self-service business intelligence (BI) for Excel featuring an easy to use interface that’s powerful enough to dig into a number of sources including relational, structured and semi-structured, OData, Web, Hadoop, Azure Marketplace, and others. 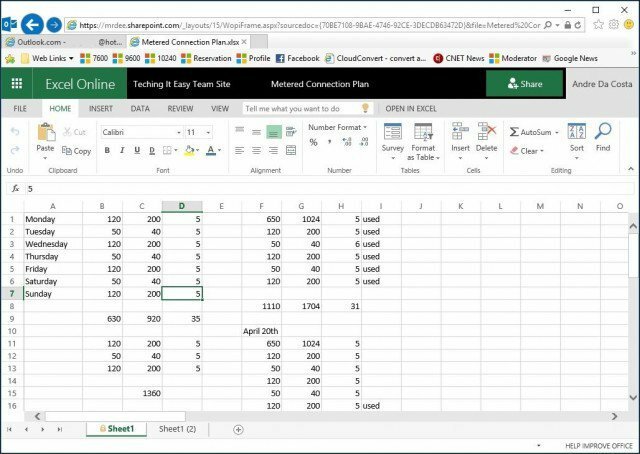 Microsoft improves Excel in Office 2016 with a read-only mode. You can open and view workbooks quickly in SharePoint — removing the need to use the desktop client. Call Monitor works intelligently, for instance when you move focus away from the current call, you’ll get a mini version of the call with Mute and End Call buttons so you can interact with the call while working on other things. The “Peek” menu/conversation control simplification is now no longer hidden until you hover. Quicker access and discovery of features and functions. 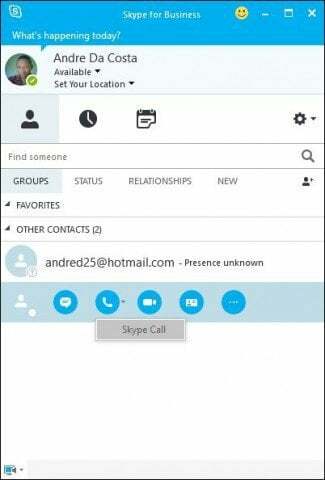 For instance, you have quicker access to the dial-pad and other calling features and in Skype for Business, you have a refreshed dial pad layout that reduces the number of clicks to the core call management tasks. Similar to the consumer chat experience, chat message bubbles are now included in updated IM experience and the new tab layout in the conversation window gives you unread message notifications so you’re always informed. Insert images with the correct orientation: Now, with automatic image rotation, once you insert an image into an app such as Word or PowerPoint, it automatically rotates the picture to match the camera’s orientation. You can manually rotate the image to any position after insertion. Note that this only affects newly inserted images and does not apply to pictures in existing documents. Pan and zoom while loading large charts/SmartArt: When working with large charts and SmartArt diagrams text will appear right away, allowing you to view and edit while the diagrams load. A placeholder for the chart or SmartArt will be displayed until the object fully renders but you can still interact with the document. Higher DPI support for 250% and 300%: Office 2016 has higher DPI support for 250% and 300% so Office documents look even better at higher screen resolutions. 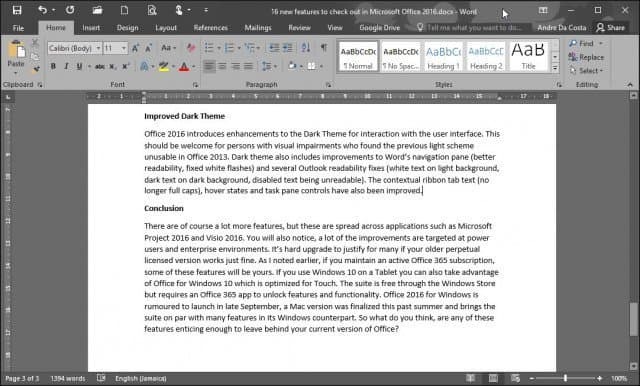 Improved Dark Theme: Office 2016 introduces enhancements to the Dark Theme for interaction with the user interface. This should be welcome for users with visual impairments who found the previous light scheme unusable in Office 2013. Dark theme also includes improvements to Word’s navigation pane (better readability, fixed white flashes) and several Outlook readability fixes (white text on light background, dark text on dark background, disabled text being unreadable). The contextual ribbon tab text (no longer full caps), hover states and task pane controls have also been improved. There are a lot more features, but these are spread across applications such as Microsoft Project 2016 and Visio 2016. You’ll also notice, a lot of the improvements are targeted at power users and enterprise environments. It’s hard to justify an upgrade for many, especially if your older perpetual licensed version works just fine. As I noted earlier, if you maintain an active Office 365 subscription, some of these features in Office 2016 will be yours. If you use Windows 10 on a tablet you can also take advantage of the UI being optimized for touch. The suite is free through the Windows Store, but requires an Office 365 app to unlock features and functionality. Office 2016 for Windows is launching September 22nd. A version of Office 2016 for Mac and should be released later this fall. So what do you think, are any of these features enticing enough to leave behind your current version of Office? 2) Security – as in keeping users from accessing other than the specific data entry areas and the specific results areas. 3) A forms facility that can allow easy generation of forms that cover the entire set of columns in a sheet, or table – and is easy to use – see Access 2010 for ideas. 4) Separate system settings from workbook settings – as in setting calculation to be manual should not be saved in a file, and then applied to all files in the next excel session that opens that file. Either it is an App level setting and does not get exported in files, or it is a file level setting and only applies to the file. without Excel getting the settings confused and then taking ages to deal with a simple row deletion. There are many examples of glitches posted on various forums, including those used by MVP’s – but MS seems to consider marketing a better place for expenditure than getting the technical bits right! James – agreed. I’ve logged a half-dozen or so issues with Office 365 on their support site that haven’t been fixed. My biggest beef is trying to get a GOOD quality image from Visio into Word. Try it yourself. Good luck. But I like the glitz. I’m all for new and creative ways of producing a document. SmartArt was sorta fun and new when Office 2010 came out, but it looks as though not much has changed since. I can’t believe a corporation that makes so much money from office apps doesn’t offer significant enhancements every year. The changes in 2016 are hardly worth calling it a new version. Once upon a time in the Office world a new version meant something – but since Office 2007 they really haven’t done much IMHO. 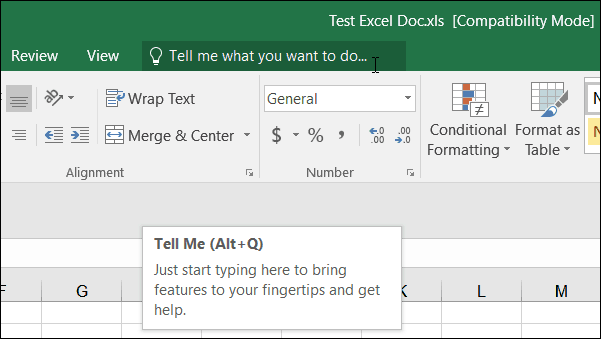 Finally – why don’t they just combine Word, PPT, Excel? Maybe throw Visio in there as well. Make it one application. Other than fiddling with the menu, I can’t see it being that difficult for thousands of developers. I know Office is a professional package but it is used by individuals as well. The reasons you have put forward mostly suit bigger business’s. For me as a lone worker who does not collaborate on work I cannot see any selling point. As I expect it will cost over £200 to upgrade from Office 2013 it is not going to happen. Unless I have missed it I could not see any mention of Outlook 2016 working with Outlook.com. That is a major failure. I know a lot of people who use Outlook 2013 in the office and Outlook.com on their mobiles/tablets and to find they do not communicate is a massive own goal especially when it is easy to get Outlook 2013 talking to Gmail/Google Calendar. (2013/2016 same problem). Due to my own personal requirements I cannot see any stand out benefits at all. I have never used Onedrive nor does anyone else I know. I don’t see the point in Skype unless you have friends/business abroad, it may be different outside the UK but when you have bundled minutes, widely available broadband and numerous free applications for video this is lost on me. I would imagine that for some the new features tick important boxes making it a must have but for me I will be saving my employers money. It’s unfortunate you don’t use OneDrive. As it was implemented in Windows 8.1, it was INCREDIBLE. If you deal with lots of files and if you use multiple computers, it is a dream. Most people, however, have only a handful of vacation pics and a few Word documents — not really enough to worry about with OneDrive. As a photographer, I did with hundreds of gigs (or more) of files on a weekly basis. My Surface Pro 3 is simply too small to hold that much data at once…so OneDrive is (*was*, actually) wonderful. However, Microsoft crippled OneDrive in Win10. If I have a directory of 500 photos (at 20mb each) and I need only three photos, I now have to download an entire directory of 500. 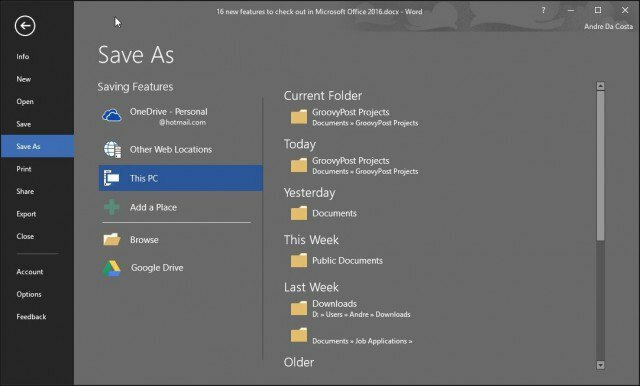 With Win8.1, I could just grab my three files…it was awesome. “Gotta do something new to justify my payroll listing” activities. Just being better at all the versions of a product that Microsoft have shipped than all the visible to the public Microsoft employed technicians, and you may well not keep MVP status. ‘you don’t count if you ain’t in MARKETING’! You know the sort of thing that has long filenames – web pages with useful information regarding new Microsoft products. Your comment does not make any sense. This article is about reasons to UPGRADE to Office 2016. Why would it mention a feature that already existed in previous versions? That wouldn’t be a reason to upgrade. 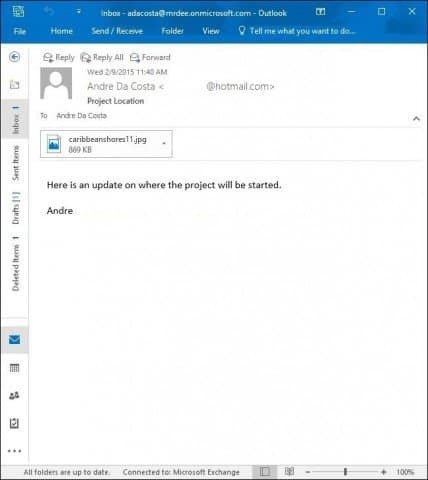 Outlook 2013 already connects to Outlook.com. Outlook 2016 does as well. Do you think this will be the last version of Microsoft Office similar to Windows 10? IE: Future will be just updates…? It has nothing that appeals to us, either, except for the changes in the dark theme that “should be welcome for users with visual impairments who found the previous light scheme unusable in Office 2013.” Even though it is my husband whose vision is poor (however, not so poor that he can’t keep his driver’s license), I sometimes have trouble when I briefly have to use his version of Word. No one should have to be “TRYING to see” anything in Word. In a good program, things should be readily evident. Oh, how I wish I had read reviews before buying Office 2013! But who would have thought that Microsoft could be so blind/stupid as to make lines barely visible? To make everything “pale and exceedingly thin, on white”? Seems to me that Microsoft owes it to the vision-impaired and even those of us who just find it hard to see all those pale, pale lines, to give Word 2013 a free update to correct the paleness problem. No matter how hard it is to use 2013, we are certainly not going throw good money after bad to buy the 2016 version. And we feel angry. Ah, well, there is always good ol’ FREE Open Office, and we have no problems with it, except for its taking a bit of time to open. If you didn’t like the white theme in Office 2013, why didn’t you use the dark theme? Open Office? Are you joking? You do know that Open Office has been dead since 2011, right? Tom: No answers for people calling others trolls. They should have stopped at Office 2003. I want my menus back. Yup. We also liked Office 2003. Even though he has been using the dark scheme of Word 2013, my husband still finds that it strains his eyes. We used 2003 until suddenly it wouldn’t work on a new computer we bought, so we were forced to change. They really need to think of accessibility while they are building these, instead of slapping it on top.. which is always on the back burner of Microsoft. I have low vision and use ZoomText screen magnifier…that, combined with the contrast, makes tools such as Lync (Skype for Business) virtually unusable. And yes, I also love Office 2003 and sometimes still use it. It had the best looks!